Grizzly Bear returns with Painted Ruins, the band's best album to date. Irony is not dead; it's been upgraded. Major label money funded Arcade Fire's Everything Now, a gag album marketed as such, once the sort of thing only possible on an off-major release like the Melvins' Prick. In the pivotal 13th episode of Showtime's Twin Peaks revival, David Lynch followed an impeccably arranged, equally hip lineup of Roadhouse performers with a "live" reprise of (cool) James Hurley's long-maligned "Just You". And Grizzly Bear, a band that once publicly lamented the low-quality leak of Veckatimest and now idealistically urges listeners to listen to new release Painted Ruins "as a whole", allows RCA/Sony to furnish reviewers with choppy online streams that expire after a few listens, stripping away listened-to tracks as the album vanishes song by song. Okay, then. Though to flip a phrase by Yoni Wolf, facing history with a little irony is one way to prepare for changes ahead. For more than a decade, Grizzly Bear has been praised for a brand of ornate rock that is, from a songwriting perspective, less memorable than contemporary music from peers also exploring baroque pop or progressive folk styles. The few years leading up to the band's breakthrough album Yellow House (2006) saw the release of Rufus Wainwright's Want One and Belle and Sebastian's Dear Catastrophe Waitress, both in 2003, Heavy Blinkers' The Night and I Are Still So Young and Magnetic Fields' i, both in 2004, and Joanna Newsom's Ys and Midlake's The Trials of Van Occupanther, both in 2006. In this same period Sufjan Stevens released Michigan (2003), Seven Swans (2004), and Illinois (2005). All of these pace-setting albums featured excellent songcraft as well as splendid production values and arrangements. To this day, many of them have not received due acclaim, while the musicians of Grizzly Bear have enjoyed a reputation as masters of a style they never owned. Yellow House impresses mostly as a mood piece, an album about place, with songs designed to linger within rooms and chambers. This quality, combined with the Warp label, motivated listeners and writers at the time to use the word "ambient" when discussing the album, though that description only works to a point. When Veckatimest was released in 2009, the music was more highly decorated, but many of the compositions lacked distinction. Jeanne Fury, writing for Record Store magazine in June 2009, described the songs of Veckatimest as "drenched in gorgeous harmonies, like chamber music by way of Laurel Canyon". That's a good way to describe how the band adorns its songs, but if that drench dries, it becomes more apparent that the band "spend[s] more time on expensive and fastidious arrangements than choruses", as Dan Weiss observed in LA Weekly ahead of 2012 release Shields. Painted Ruins is the best Grizzly Bear album to date because the band has turned away from previous tendencies to oversell folk-rock "ambience" or to crowd songs to alienating effect. The album begins like Tracks and Traces and ends like b-sides from Amnesiac. As a whole, Painted Ruins is more concentrated than its predecessors, but at times it is also noisier, messier, and considerably more populated with hooks than any previous release by the band. Ironically, working against its presumed brand positions the band to be more vital than ever. What the band does differently this time includes a refreshed variety of musical references, a sturdier, more focused approach to rhythm, and most significantly a unifying theme of ruin. Painted Ruins makes a strong impression right away with "Wasted Acres," which plays in form and function like Robert Wyatt's version of "Stay Tuned" from Comicopera. While the song is admittedly front-loaded, the image it paints of riding a Honda and asking "were you riding with me / were you even listening," paired with "trust in your machine" invites some kind of emotional recall that intensifies as the lyrical and musical phrases repeat. Another single, "Mourning Sound", builds on "Wasted Acres" by being likewise concerned with moving and motion, and with listening to a place, including sounds of trucks and shots. It's a song that borrows from a number of pop/rock music periods, including new wave and whatever turn-of-century revivals thereof informed these musicians' approach to rhythmic rock. But the stunning chorus takes a detour, unexpectedly and pleasingly, into a mode heavily indebted to The Trials of Van Occupanther, the defining "progressive folk" album of 2006 and also sharing the theme of needing to move outside of modern time and space. Contrasting with the pleasant melody of the chorus are noisy, even abrasive, guitar textures that move Grizzly Bear away from the handsome production style that has stifled some of its past work. "Four Cypresses", which concerns immobility rather than moving, similarly uses noise to tell a story about chaos and sound. It's so satisfying to hear Grizzly Bear follow a progressive rock thrust outward into the kind of territory King Crimson covered on its underrated Lizard. "Three Rings" is the first song on the album that seems overstuffed, but the song works in the manner of In Rainbows-era Radiohead and includes a touch of Animal Collective's "Leaf House," as if the album is fixated on sources from the years surrounding Yellow House. "Losing All Sense" updates Veckatimest hit "Two Weeks" by picking up that song's pace but also finding more musical and emotional variety within it. To include a song that could be accused of calculatingly attempting to recapture past glory is a risk, but it pays off here because this song bests "Two Weeks", exhibiting a greater range of musical directions, such as a chorus that creates the effect of a physical descent and emotional unmooring. The highlight of Painted Ruins is "Aquarian", a song that pushes further into a heavy progressive rock mode, in this case sounding similar to Goblin, the likeness a welcome surprise. A menacing instrumental introduction sets up vocals that seem somehow too upbeat, but that impression of incongruity pays off when later movements of the song tie those strands together. "Neighbors", a later track, offers a quasi-medley of earlier moments from this very album, a technique that seems to inductively illustrate the spirit of the project as a whole; bringing the Grizzly Bear sound into more precise shape, combining a few judiciously chosen, distinct elements, and then reaching some conclusions about how those elements fit together. The lesser material on the album all occurs in the second half. "Cut-out" seems alternately overwritten and stuck in a rut. "Glass Hillside" plays like an inferior version of Ween's "Right to the Ways and the Rules of the World". "Systole" is particularly anemic in its counteraction of the brawnier sound of much of the album that precedes it. But none of these songs derails the album because the thematic unity remains strong from start to finish. 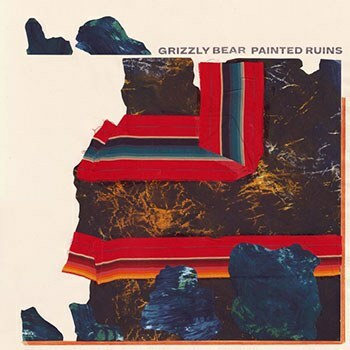 Though it is stating the obvious to identify "ruin" as the primary theme of Painted Ruins, Grizzly Bear explores the emotional and philosophical dimensions of that theme in a profound way. This, too, connects to Yellow House as the first song on that album ("Easier") was memorable in part for its portrait of domestic ruin and another song, "Marla," was a family story of a late musician's unrealized potential. Thus ruin has been present in Grizzly Bear's music since these musicians released their first album together, but Painted Ruins is an extended rumination on ruin, particularly in the way Svetlana Boym articulated the connotations of ruins as "remainders and reminders." Remainders and reminders, present as mentioned in the musical forms of Painted Ruins, permeate the lyrics of the album, assessing what's lost, what's left, and what can be learned. In "Mourning Sound," love is the thing that ages, left to "burn out and die". The "Four Cypresses" are "torn from the roadside… some thousands of years built up / some crumbling form to be torn down / living in a pile / tangled in a pile." "Losing All Sense" might well be a summary of the album's relationship to ruin: "take the past, own your scars, let it show." "Aquarian" involves "the knowledge you can’t win with what remains" and "burning ground / that separates this mind from all that’s passed." Perhaps most poignant is "Neighbors," which confronts breaking bodies and the fact that "every passing day / our history fades away." In the end, the chief irony of Painted Ruins is that this album tackling the heavy subject of all things crumbling and passing ends up being the band's most alive, cohesive offering.